NASA astronaut Mike Hopkins flies above Peru while attached to the station's robotic arm during a spacewalk. HOUSTON — Astronauts aboard the International Space Station have received a gift just in time for Christmas: a new pump module to repair their ailing cooling system and to restore the outpost to full power. NASA astronauts Rick Mastracchio and Mike Hopkins embarked on their second spacewalk together, setting out at 6:53 a.m. EST (1153 GMT) on Tuesday (Dec. 24) to complete the work they began Saturday to remove and replace an ammonia pump module with a faulty flow control valve. NASA's Mike Hopkins holds the space station's new pump module while floating past a Russian Soyuz spacecraft. "No, thank you guys," astronaut capcom Doug Wheelock replied from NASA's Mission Control in Houston. "It is the best Christmas ever. Thanks, guys." "I'd just like to add to that," Hopkins said. "Fantastic work, merry Christmas to everybody. It took a couple of licks to get her done, but we got it." The Christmas Eve EVA — extravehicular activity, NASA’s term for a spacewalk — had the two astronauts retrieve a spare of the refrigerator-size cooling system device and install it on the space station’s starboard, or right, side backbone truss. The 780-pound (355 kg) pump module replaced a faulty unit Mastracchio and Hopkins successfully and speedily removed three days ago. The removal, which came just 10 days after a valve inside the module ceased working properly, was originally slated to be part of this second outing, but Mastracchio and Hopkins made quick work of disconnecting the degraded unit, allowing them the time to also remove and stow the module during the spacewalk Saturday. Their get-ahead work negated the need for a planned third spacewalk. The failure of the flow control valve, which regulates the temperature of the ammonia coolant passing through the pump, resulted in restricting the space station to the use of just half of its cooling loop system needed to maintain equipment temperatures inside and outside of the outpost. Non-critical systems and science experiment hardware in two of the station’s laboratories have been without power since the valve malfunctioned on Dec. 11. NASA astronaut Mike Hopkins prepares to attach himself to the International Space Station's robotic arm during a Christmas Eve spacewalk on Dec. 24, 2013. The new pump module, installed by Mastracchio and Hopkins on Tuesday, was to return the space station to its full cooling and power capacity. Trading spaces since their spacewalk together on Saturday, Hopkins, riding the end of the station’s robotic arm, and Mastracchio working alongside him, retrieved the spare pump module from the station’s External Stowage Platform 3 (ESP-3) and installed it in the slot on the truss they earlier emptied of the faulty unit. “Mike, I think you're in charge now of the pump module,” Japanese astronaut Koichi Wakata radioed Hopkins as he controlled the robotic arm to pull Hopkins and the spare pump module away from the stowage platform. “It looks good, you're doing a great job, it looks beautiful." The two astronauts then set about connecting five electrical and four fluid lines linking the new module to the station’s systems. In the process, the pair ran into some trouble freeing one of the so-called “quick disconnect” lines from a temporary jumper box that the two installed during Saturday’s spacewalk. “One thing we never expected,” Mastracchio observed. “Getting it off the jumper box?” Hopkins replied. “About one little snowflake a second,” Mastracchio reported to Mission Control, adding that the flakes did make contact with both astronauts’ spacesuits, a contamination concern. As the line was vented, the astronauts confirmed it had “stopped snowing” and they proceeded with connecting it and the remaining lines to the new pump module. All nine lines were connected at about 12:45 p.m. EST (1645 GMT), 5 hours and 52 minutes into the spacewalk. “Houston you have a new pump module,” Mastracchio radioed Mission Control. With the new pump module in place and its lines connected, flight controllers on the ground will work on Tuesday evening to test the unit and then, if everything checks out, begin reintegrating it into the space station’s cooling system over the next day. Tuesday’s spacewalk marked Mastracchio’s eighth career EVA and Hopkins’ second. It was the 176th spacewalk devoted to the assembly and maintenance of the International Space Station and the 10th such outing in 2013. One more spacewalk this year is scheduled for Friday (Dec. 27) by cosmonauts Oleg Kotov and Sergey Ryazanskiy to install a pair of high-fidelity cameras and refresh several experiment packages on the exterior of the Russian segment of the station. 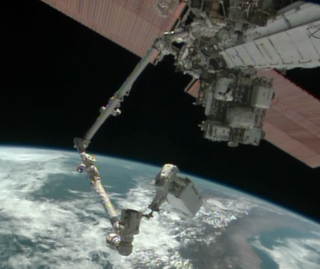 Tuesday’s EVA was only the second Christmas Eve spacewalk conducted in history. Fourteen years ago, space shuttle Discovery astronauts Steve Smith and John Grunsfeld conducted an 8-hour, 8-minute excursion on Dec. 24, 1999 to upgrade and install new insulation on the Hubble Space Telescope. Editor's Note: This story was updated to reflect a change at 1:53 p.m. EST. The astronauts did not need to perform a "bake out" after cleaning up during the spacewalk. The story was also updated to add more details about the spacewalk.